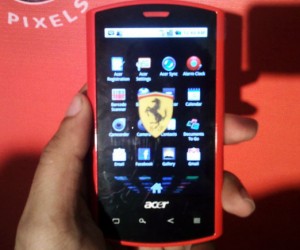 Today at IFA Acer released an android (2.3) phone. Now this phone may seem awesome when you look at the phone but besides a cool red paint job the phone lacks in the ‘Ferrari’ part. So the phones name may contradict the specs as this phone should be slow and sluggish but, if your a fan of a nice looking device this definitely may be your choice!